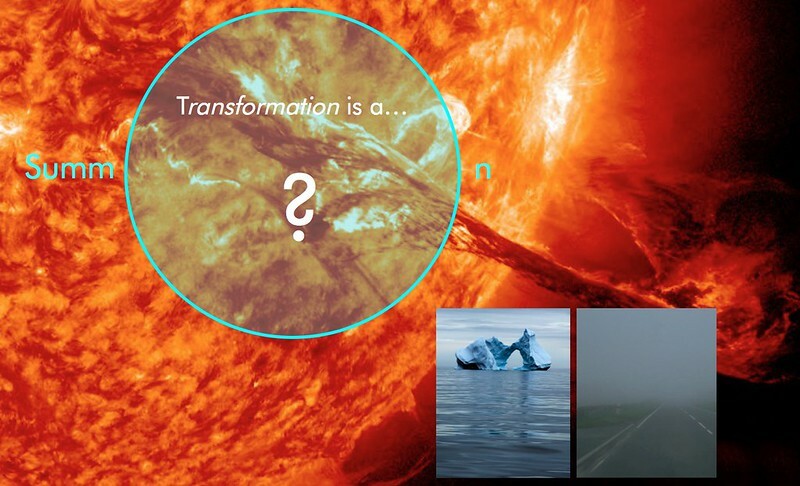 Transformation is a tricky word. When talking about Understanding people, we used a picture of an iceberg, and then in the story about Exploring futures we introduced it though a metaphor of a foggy road. These images have example of transformations – ice to water, water to vapor. But there are other, more complex processes of transformation, such as turning of matter into its fourth state, plasma and (the Sun can be a good example here). This is transformation without any Ctrl-Z key. Various educational activities is one form of transformation that we practice very often. We actively share our knowledge, and in various formats – presentations, lectures, master-classes, demo-workshops – both off-line and online. We have a large collection of cases of strategic innovation, both general and industry-specific. We present them and discuss with our clients, learning from successes and failures. We also have a series of presentations about methods and tools, related to the three main domains of our activities – people research, future studies and transformational techniques. Check our list of presentations – or let us know what you are interested in! Listening a lecture is one things, trying new things in practical way is another. We try to always introduce a PIY, Practice It Yourself, mode in our training sessions and creative workshops – including ‘serious games’ that we develop and play. There are games that can enhance the learning process: you move from A to B, but somewhat more efficiently (e.g., quicker, and having more fun on a way). There are other games, that can potentially move you beyond Z. The can help you to reveal something new, or to (trans) form something new in you or your organization. We design our games very carefully, with a Zone of Proximal Development concept in mind – to stretch you, but not to overstretch. The ultimate challenge for us is not to design a super-game that will help you to transform. The ultimate challenge is to teach you to design the super-games that will help you to transform yourself – and others. Our latest product, Spirals of Gamification™, is design to tell about the pasts, the present, and the futures of gamification, and eventually make you the Master of Games.